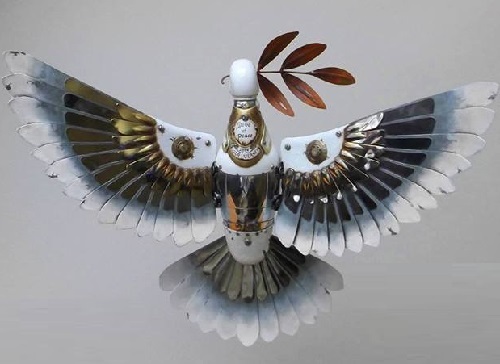 Talented Indian sculptor Haribaabu Naatesam (“Hari”) makes beautiful sculptures from the remnants and broken parts of electronics in his Mumbai studio. Medium he uses – out-of date motherboards, floppy disks, mobile phones, CDs, watches, and record players. With a vision of artist, the sculptor gathers them together to create stunning works of art. He really breathes a new life into the broken gadgets, transforming them into anything, from birds and crabs to shoes and transport. Haribaabu Naatesam graduated from the Chennai Fine Arts College, then the National Institute of Design in Ahmadabad. The Indian maestro can answer the question, whether there is a soul in camera phones and players. It’s thanks to him that the souls of dead gadgets move to sculpture and live on, continuing to delight audiences. 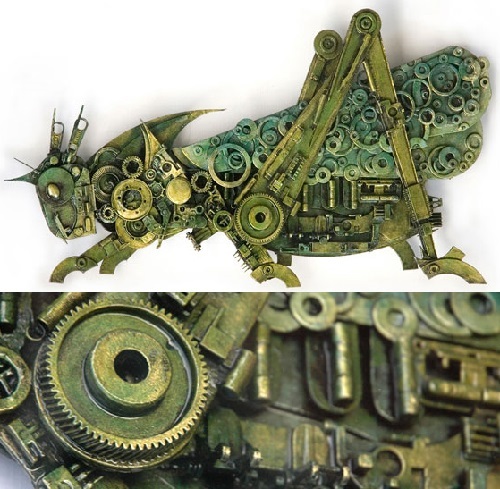 Krasnoyarsk based Steampunk sculptor Igor Verniy has created a stunning steampunk gallery of cute cyberpunk creatures and mobile models of wildlife. The 22-year-old master Igor Verniy graduated from Moscow State University. He is an engineer in the field of metal, and a specialist in the evolution of stars and astrophysics. Meanwhile, Igor Verniy writes on his page: “In the 21st century there are still fans of old school ideas. These are people who are nostalgic for rusty metal, gears, and the smell of motor oil”. According to Igor, he is one of those True Metal fans. Igor creates his models out of auto parts, parts of old watches, cigarette lighters, home appliances, electronics, etc. American sculptor Brian Marshall from Wilmington, Delaware, has created The world’s first robot orphanage. In particular, the entire army of cute robots, with nice expression and great stance. And looking at them you can’t resist not to adopt one of them. Meanwhile, the artist himself calls his gallery of sculptures “adopt a bot”, which is worth doing. 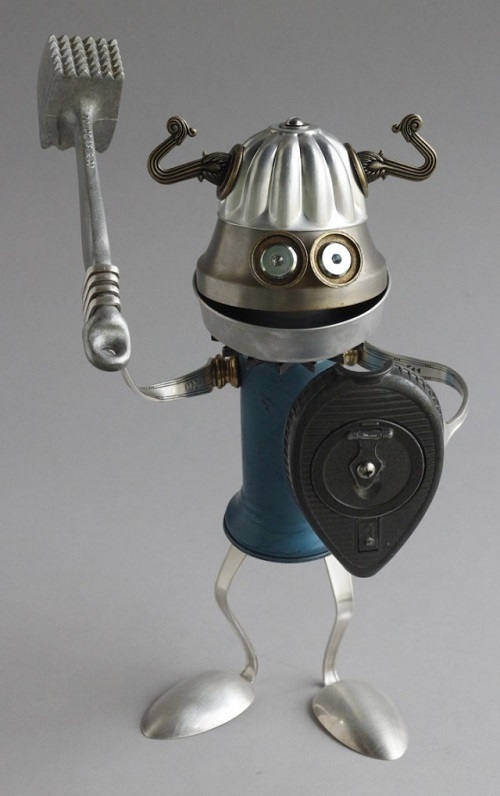 Every “orphan” – made of found objects – old cutlery, discarded cans, car parts, any metal objects. According to Brian Marshall, he began making these cute robots quite innocently. He collected various broken utensils, disassembled them into parts, and then created amusing figures of mechanical men. And then, he just gave some of his creations to his friends. Over time, the collection widened, gaining prominence. His wonderful robots made ​​from scrap metal, began to find their owners. A young artist has been creating beautifully detailed sculptures for some years already, and it’s not just a hobby, it’s an obsession. In 2000-2001, in Moscow took place the global mail-art project “Sewers of the World, Unite!”. And its foundation beczme the manhole photos from around the world, as well as the author’s interpretation of the theme in the form of creative projects and facilities. on the road, or right on the sidewalks. Meanwhile, if the manholes are on the road – they perform utilitarian function. However, with sidewalks the story is different. Noteworthy, manholes on the pedestrian zone can not be ugly, because tourists judge about the city by design of the manholes as well. 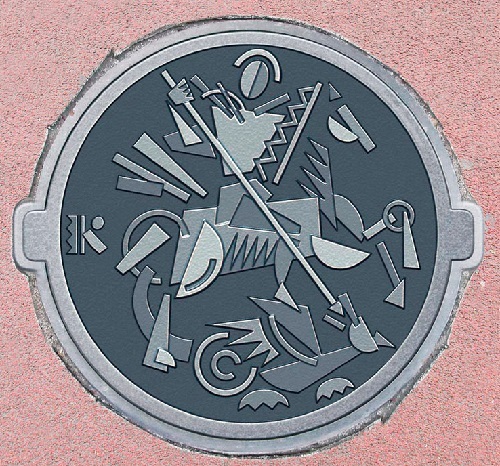 And in the cities where people love and respect their place of living, the manholes can be a real piece of art. ‘American Legacy’ highlights the significance of arms in America, both historically, militarily and individually. In reverence to Liberty, it acknowledges the necessity of arms to defend it, while questioning the many military actions waged in its name. 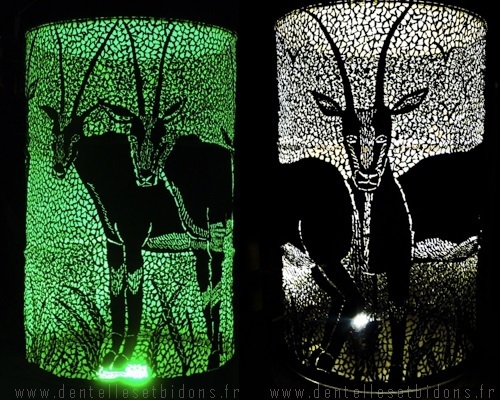 Highly exclusive, made in the technique of Zlatoust engraving art ​​by the hands of skilled craftsmen, these products are tineless. 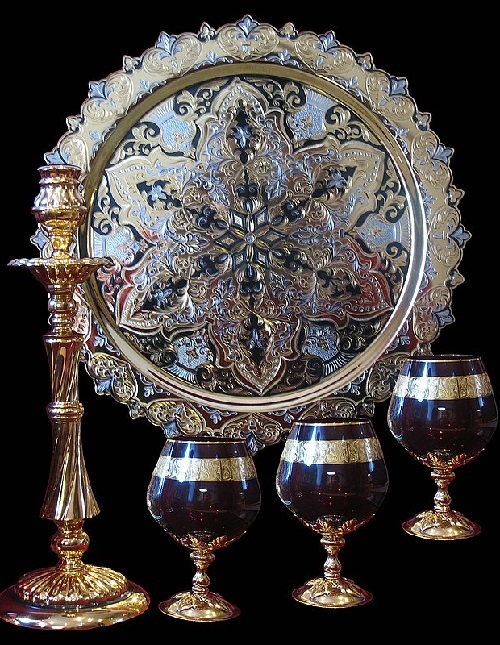 Traditionally, masters use brass, nickel and gold, and work in the technique of multi-cycle application, artistic prints, panache brush, etching, and nickel plating. Founded in 1754, Zlatoust got its name after St. John Zlatoust. The city, surrounded by the mountains of the Southern Ural, became the place for constructing an arms factory in 1815. The factory produced a variety of types of bladed weapons (swords, sabers, swords, daggers, and knives). Meanwhile, in addition to arms, there appeared a rare art – steel engraving. 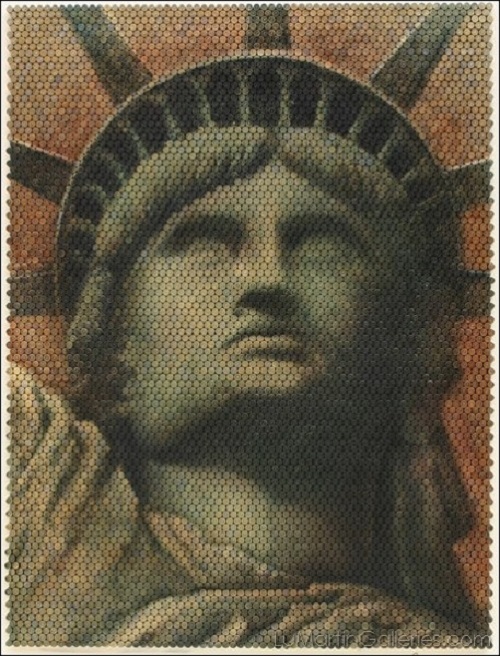 And the great contribution to the development of prints made ​​P.P. Anosov – Russian scientist and metallurgist. It was under his leadership, for the first time Russia obtained damask steel.